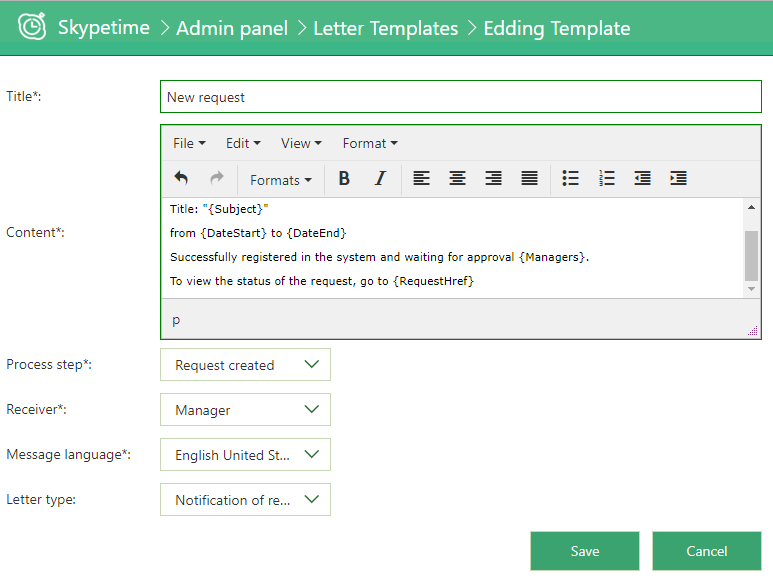 This section is intended for setting up templates for emails that are received by all users who participate in the “created request – decided” process. Request is created: notification of the created request is sent to the Mamager for approval, to the Supervisor for information, and to the User – for notification that the request registered in the system. A decision on the request was taken : notification comes to the User and the Supervisor. Click “Create template” to add new one. To edit a created query, click on its title in the list of all templates. In the window that opens, make the necessary edits and click the “Save” button. To delete one or more templates, check the required headers and click the “Delete Templates” button.